"Weather forecast suggests downpours will return on Wednesday," Meteorological Department director-general Wanchai Sakudomchai said yesterday. Floodwater poses the biggest obstacle to the rescue operations that began on June 23 when the 12 football players from the Mu Pa Academy in Mae Sai district and their coach went missing. They were last seen entering the Tham Luang cave in Chiang Rai province. As flash floods hit the cave, they are believed to have been stranded inside for more than one week now. According to Medical Services Department's director-general Somsak Akksilp, people can do without food for between 30 and 35 days if they are able to drink water. However, in the middle of last week, even the SEALs had to retreat to a spot closer to the cave's entrance because of the rising and raging floodwaters. Only after rains eased on Saturday, water-drainage efforts started to yield tangible results paving way for the SEALs to make significant progress inside the cave yesterday.As of press time, the SEALs were already 200 metres from a T-junction inside the cave. 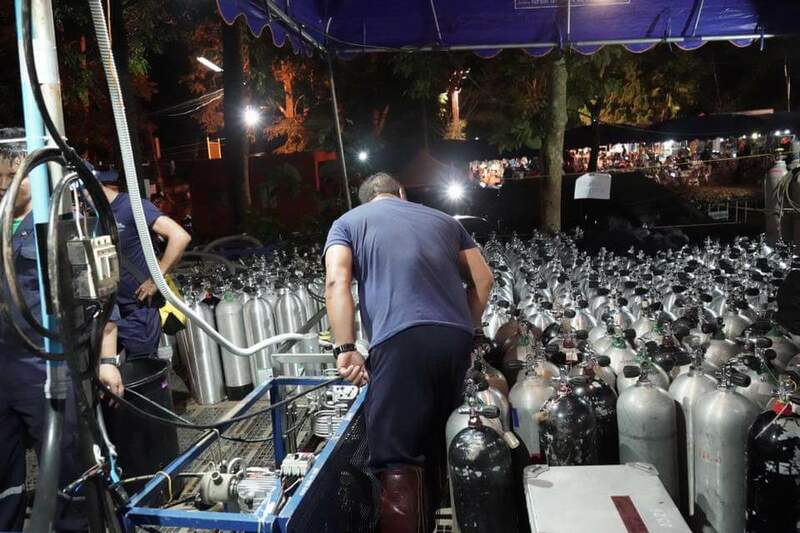 From that point, they will be only be about 1.5 kilometres from the so-called "Pattaya Beach" chamber where the footballers are believed to have gathered to stay clear of the floods. The intersection is about 800 metres from the cave's third chamber. Inside the chamber, SEALs have already set up their forward command. Light bulbs and oxygen tanks are stored there. Foreign diving experts from Britain, Australia and China have now joined the SEALs operations. At present, powerful pumps have been installed to pump out as much water as possible from the cave. The groundwater in nearby areas has been drained away to downstream zones too based on the beliefs that floodwater from the cave will then seep out faster. People living in downstream zones are willing to put up with flooding if it can assist the rescue efforts. "This is a very good day for me," Chiang Rai Governor Narongsak Osottanakorn said yesterday evening. His words led to widespread speculation that the rescue efforts must have progressed really well in the day. A shaft there looks promising enough as police paratroopers together with foreign experts have managed to go down to a depth of at least 40 metres. Explorations are ongoing to determine whether this shaft can connect to the dry part of the Tham Luang cave. Engineering Institute of Thailand president Thanet Wirasiri, meanwhile, is working on another promising shaft. "This one is near the far end of the cave," he said. Thanet said the first section of the shaft from its mouth stretched down for about nine metres after which it levelled for a stretch of two metres. "From there, the shaft stretches down vertically again for about seven metres and hits a rock," he said. Thanet said although big rocks blocked the way, his team had not yet lost hope. 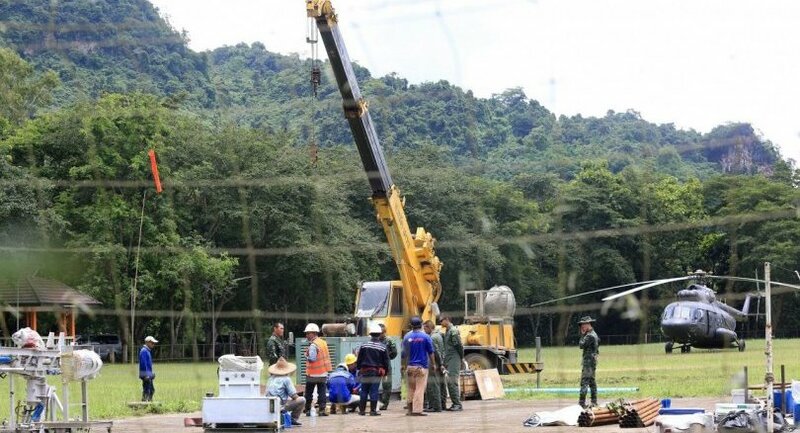 "This is because imaging technologies have suggested that this shaft may connect directly to the latter part of the Tham Luang cave," he said. Thanet said his team would sprinkle colourful powder into this shaft and see whether the water will bring it down to the cave. "If divers in the cave see the colours, we will plan our next step on how to remove the rock," he said. Drilling solutions have already been taken up as alternate ways to save the stranded victims. At the mouth of the cave, medical workers already have plans on how to treat and move victims when the footballers are found. A field hospital has now gone up near the mouth of the cave to perform urgent surgery, if necessary. 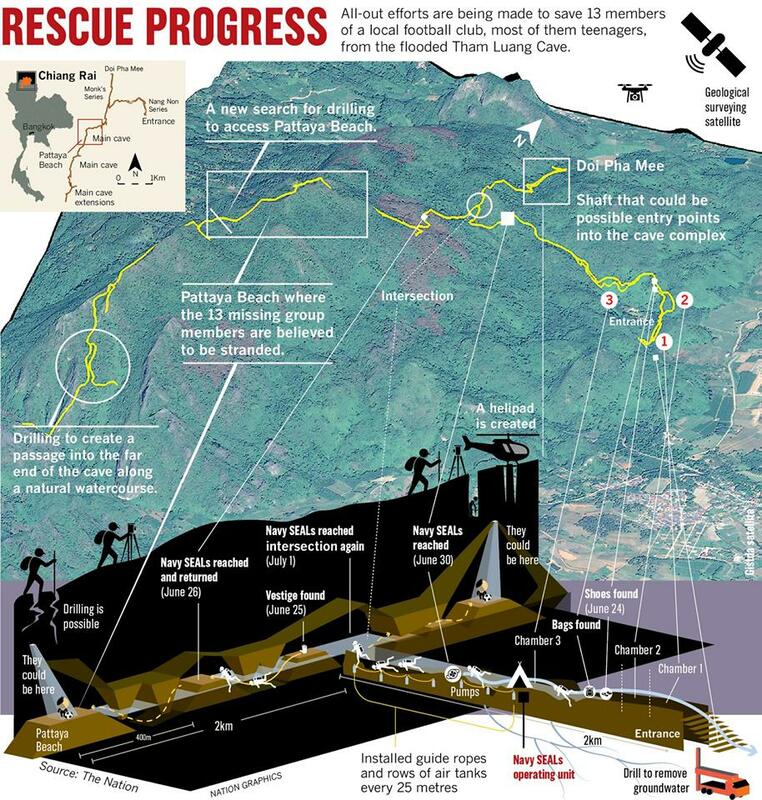 * The Royal Thai Navy's SEALs set up a forward command in the third chamber of the Tham Luang cave. * The SEALs venture out of the third chamber to get closer to "Pattaya Beach" where the stranded footballers may have gathered.